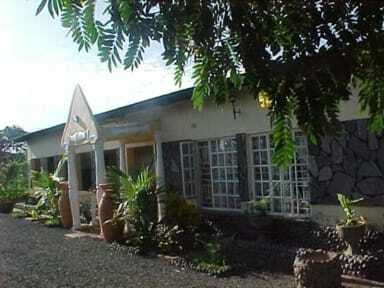 Are you Looking For a Quiet Place , Private & Self-contained Rooms at Affordable Prices, This is it !. The Guest House is located in a beautiful country environment, Zambia the home of the famous Victoria Falls, 'The Smoke That Thunders'. We are only 10km from the Victoria Falls.Come and enjoy relaxing and sunbathing in our Green Garden with traditional Isaka. We host both international and local guests. The airport is only 8 minutes drive. Our rooms and shower are spotlessly clean. 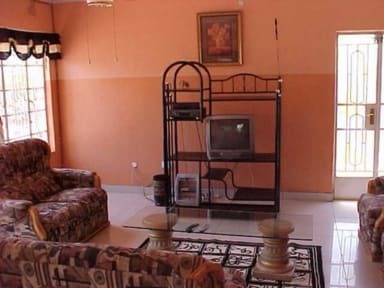 All the rooms are self-contained with niece beds, Dstv,mini-fridge bar, Air-corn,Mosiquito net and Ceiling fan. - FREE pickup from the airport. - FREE daily drop on departure to the airport. - Car, Mini-bus and Van rentals are available at reasonable rates. -Guest are welcomed to use our kitchen facilities for coffee/tea, lunch and supper 24/7. - We also arrange tour packages eg. boat cruise, canoeing, bungi jump etc. check in time is 10:30am and check out 10:00am. Sorry no children alone under the of 10. Unless accompanied by parents.